Connecting with our customers is important to us. Every inquiry is evaluated and directed to the appropriate manager for response. Our toll free number is 1-800-218-7450. If you wish to speak to our recruiter, please call 1-888-578-9066. Acuren’s world-class team of engineers has extensive experience both in the field and in our laboratories to provide a higher level of reliability. Our extensive professional engineering experience is supported by our NADCAP and ISO/IEC accredited in-house laboratory facilities in Vancouver, Calgary, Edmonton, Sarnia, Mississauga, Saint John, St. John’s, Austin, TX and Cincinnati, OH. Of our five chemical and testing laboratories in Canada, the three located in Richmond, Edmonton and Mississauga, are ISO 17025 registered. Materials testing is brought to the field through portable techniques, including hardness testing, positive material identification (PMI), chemical spark testing, and in-situ metallography. Failure analysis, product evaluations, specialized material testing, litigation support, and more is handled by Acuren’s experienced teams of materials engineers. Acuren’s ISO 17025 certified laboratories provide mechanical, chemical, and environmental testing of metallics and non-metallics, including X-Ray Diffraction and CTOD testing. Acuren’s reliability engineering services provides world-class asset management solutions and programs to successfully reduce our clients’ operating costs through effective and proven lean maintenance strategies. Acuren offers you an unrivaled spectrum of traditional and advanced nondestructive testing and NDE methods to ensure cost-effective and accurate inspection results. 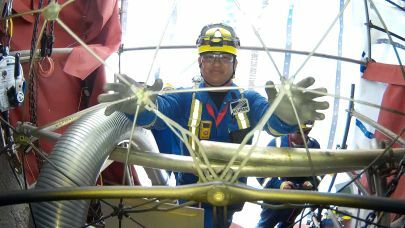 Acuren provides integrated industrial services including inspection, repair and maintenance using composite crews with multi-disciplined trades, experienced personnel, IRATA certified technicians, and customized access optimization programs. Each month Acuren Condition Based Monitoring Specialists collect machinery vibration and structure borne ultrasonic data as part of the regular condition monitoring program at Irving Wallboard. During a planned outage ultrasonic testing and visual inspection revealed that a significant portion of the pump box floor either needed to be repaired, or cut out and replaced. Acuren has the equipment and certified professionals ready to efficiently carry out comprehensive API and non-API tank inspections and can inspect any tank, of any material or size, including large diameter, small diameter, vertical and horizontal tanks. You can trust the skilled professionals at Acuren to offer highly specialized talent and expert services to refining, extraction, and petrochemical industrial clients. Acuren’s experts, knowledge and efficiency can be an essential part of evaluating critical pulp and paper facility assets such as boilers, digesters, piping, tanks, pressure vessels and rotating equipment. 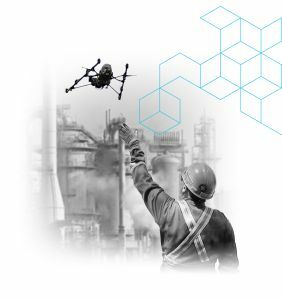 What Our Customers Should Know - Are You Considering Inspection Via Drones?